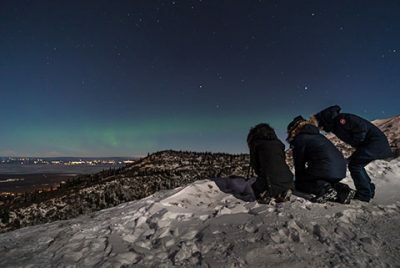 If auroras are happening, we'll pick you up at your accommodations and take you on a nocturnal adventure to witness the magical lights rippling over snowy peaks and dancing across dark waters. 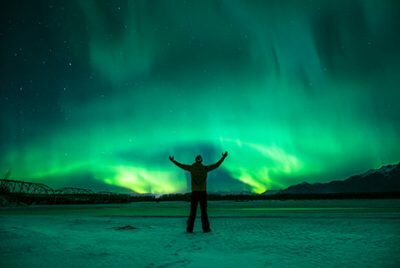 This northern lights photo tour increases your chance of aurora viewing success by allowing you to reserve as many nights as you like [space available] and paying only when when conditions are right for the tour to run. It's the perfect compliment to winter day tours and a great option for business travelers to Alaska during August to April. Led by a professional photographer guide, this tour accommodates serious photographers to sightseers. 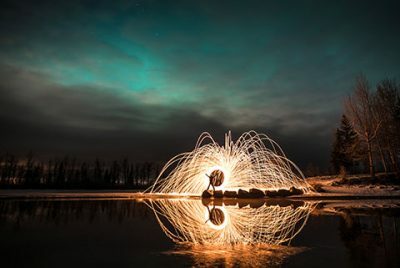 Photographic coaching and aurora portraits are provided for those who desire. Be sure to read important booking information below prior to making a reservation. 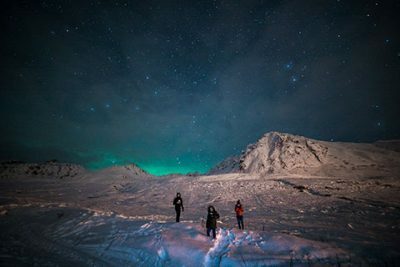 This is a small group northern lights photo tour for photographers and sightseers alike, though due to demand and limited seating, no discounts are available for non-photographers. Nightly, August 7 to May 5 when conditions are right, which means at least 2Kp and less than 25% cloud cover. Departure is between 9-10 pm. Once the tour is confirmed to run, you will receive a specific pickup time at your Anchorage area location by text and/or email no later than 7 pm. 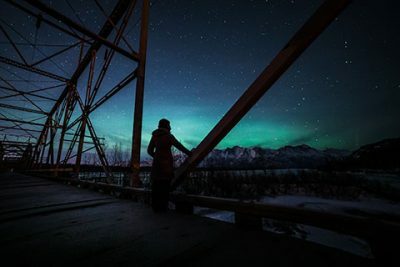 Ssshhh, it's a secret, but we have several favorite spots within a 70-mile radius of Anchorage that offer wonderful views of the night sky, and great land features such as reflective lakes, forests and mountain peaks. After pickup at your Anchorage area accommodations, the locations we visit are based on conditions at the time. We may travel to 1-3 locations during the evening. Anchorage area hotel pickup and drop-off (Girdwood and Alyeska Resort bookings may be made for groups of 6 or more). 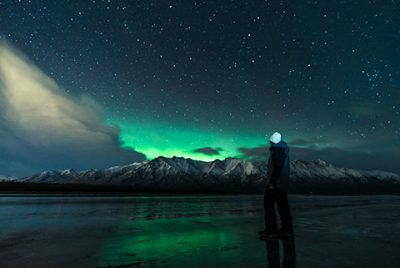 Narrative on the science and lore surrounding auroras provided by your guide. Light snacks and water (we strive to reduce the amount of plastic that ends up in the environment, so fresh water from a jug along with refillable cups). Hot beverage selection including hot cocoa, cider, tea or coffee. Creative and technical photography instruction is offered by your professional photographer guide. A limited number of tripods are available for loan. Photography equipment rental is available upon request. Rest up before your scheduled booking(s). Dress in warm layers! We may be away from the vehicle for up to 1-hour. It's important to gear up appropriately and plan to keep moving while out. It's also better to wear one pair of warm socks than two. This is because the more socks you add, the more likely you are to constrict circulation. Try to leave a pocket of airspace around your foot in the boot. Also wear a warm, moisture-wicking under layer, mid layer [preferably fleece] and thick, snow proof outer layer, along with hat, scarf and gloves. Arctic gear including bibs, parka and boots is available to rent at 6th Avenue Outfitters. 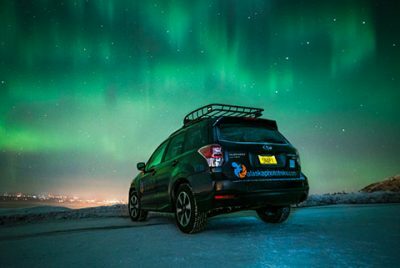 If capturing the northern lights on camera is your main objective, we recommend reading a How to Photograph Northern Lights before the tour. You'll receive additional coaching in the field. This is a moderate activity that involves short walks on snow and ice. Weather conditions may include wind, and temperatures range from 0ºF [-17ºC] to 50ºF [10ºC]. A specially outfitted high-top 12-passenger van. Driver is your photography guide. Q: How likely am I to see auroras? A: Aurora viewing is dependent on both space and earth weather. While forecasts for the former are based on much scientific data coming from many tracking stations, space weather tracking and research is still in its infancy, and data is available only from a limited number of satellites. It's best to expect the unexpected. Based on the previous year's statistics, conditions were right to run 28% of the scheduled tours. Of the tours that ran, auroras were seen 90% of the time. Your chances increase greatly the more nights you have available to tour. Q: How many reservations can I make? A: As many as you like. Just be sure to enter a separate reservation for each night, so you are not overcharged if/when the tour runs. Also, cancel reservations as quickly as possible if your plans change. 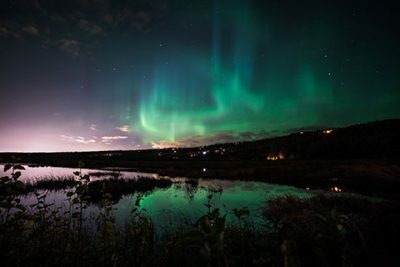 Q: Are there refunds if auroras don't show or are not very active? A: We do our very best to ensure conditions are optimal to see auroras. Nature sometimes surprises us in pleasant and unpleasant ways. Whatever happens, it is our aim to make the best of it. 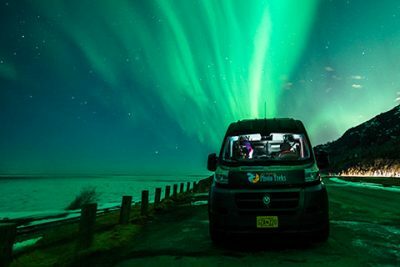 We will show you a variety of night photography techniques and prepare you for taking advantage of a better aurora viewing situation you will hopefully experience in the future. Once the tour commits to run and you have submitted payment, there are no refunds regardless of conditions. 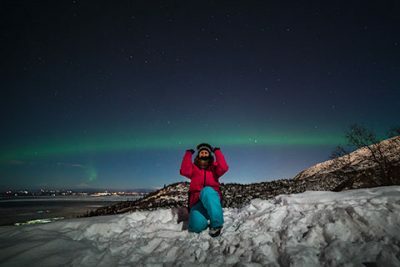 Q: What happens if I book multiple nights and successfully see auroras early on? A: You may cancel the remaining reservations or keep them. We've had guests go out with us multiple nights and often, when auroras get going, they stay active for several nights in a row. Q: I made a reservation, what's next? A: Enjoy your day in Anchorage and if the weather is clear, it might be wise to take an afternoon nap. Check the aurora report here by noon and if the tour posts to run, submit payment by 3 pm. Once payment is received, you will be given a pickup time at your location. Q: How far from Anchorage does the tour travel? A: Our destination each night will vary according to conditions, but we usually travel within a 70-mile radius and visit 1-3 locations. Q: How long will I be outside? A: Up to 2 hours. There are some locations where we may stay within close range of the vehicle, and others where we may walk up to 1-mile. Much depends on conditions and capability of the group. Q: Are there restrooms available? A: Not many. Most State Park Restrooms are closed this time of year and there are few other options available in the wee hours of the night, other than a bush or tree. Toilet paper is provided. Q: Will I learn to photograph the northern lights? A: Yes! The tour is guided by a professional photographer who will help you set your camera in advance and explain what the settings do. Q: Do I have to be a photographer to take this tour? A: No! We have many sightseeing guests. 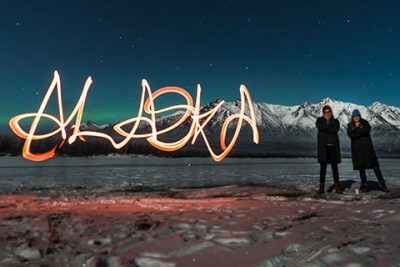 The tour is guided by professional photographers, so if you would like a complimentary aurora portrait you can have one. Q: I've heard Fairbanks is the best aurora viewing location in Alaska, can you really see auroras from Anchorage? 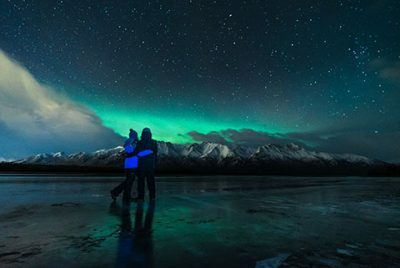 A: Anchorage is within the aurora oval (region on earth where auroras are most frequently seen), and has its fair share of viewable nights. 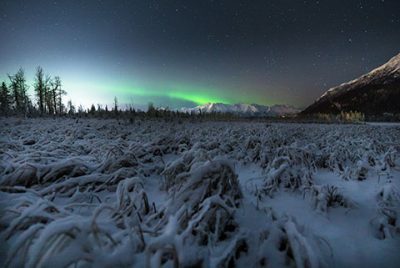 There are also some distinct advantages for aurora chasing in Southcentral Alaska. PLEASE DO NOT PREPAY THIS TOUR. Your reservation is complete once you have entered your booking information. You will receive an email confirmation and instructions when/if to submit payment on the day of the tour. Read additional Important Booking Information below prior to making a reservation. 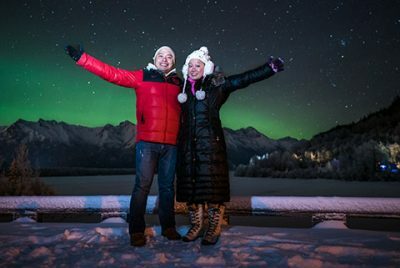 Make as many reservations as you like [separate for each night], but please DO NOT ENTER PAYMENT until the Aurora Report announces the tour will run. It is both costly [due to merchant processing fees] and time consuming for us to refund prepayments. If you prepay and the tour cancels due to poor conditions, there is a 10% charge to cover these costs. Cancel your reservation at least 24-hours in advance if your plans change. If you are not available for the night you reserved and the tour runs, you may be billed for your seat if it was too late to fill with another guest. You may opt out of a tour if conditions are marginal, but taking a risk occasionally pays off. In any case, let us know your preference no later than 3 pm on the date of tour, so if there are other guests on the wait list, they will have a chance to tour if you decide not to. A 2-person minumum is required to run this tour. If the minimum is not met, you may be given the option to purchase a second seat, reschedule, or cancel. 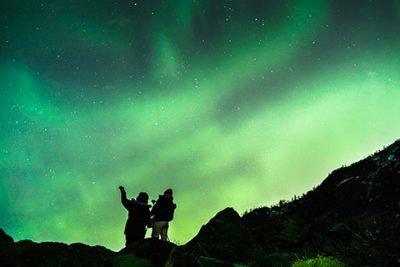 Payment is confirmation of your acknowledgment of the risk inherent in this natural phenomenon; once it's received and the tour departs, no refund will be issued if auroras do not appear as expected. Planetary K-Index: indicates how far south in latitude on earth auroras might be seen. It is measured on a scale of 0-9, and indicates locations where the aurora borealis can be visible overhead. 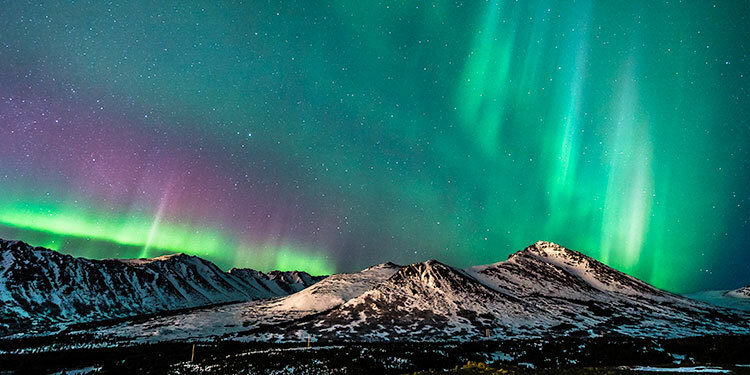 Anchorage is within the Kp3 zone, but auroras are often seen here on the horizon at Kp2. A fairly accurate Kp index can be determined up to 3-days in advance. 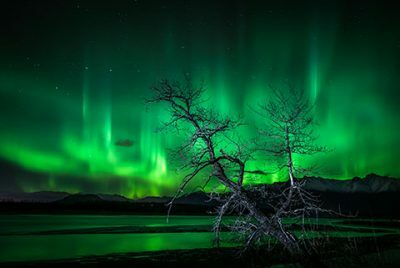 For the Kp index indicated in the Aurora Report below, that is the maximum Kp predicted during the prime aurora viewing time in the Anchorage area (between 11:00 p.m. and 4:00 a.m.). 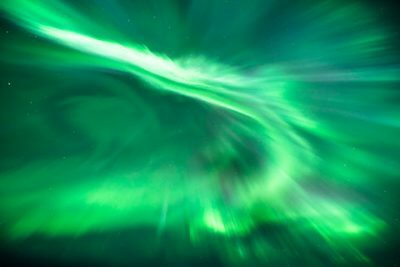 Hemispheric Power: a measure of auroral activity that helps determine how bright and active auroras might be. It's measured on a scale of 5-150 GW [Gigawatts]. A power level of 20 or more is usually adequate to produce auroras visible to the naked eye. Hemispheric Power fluctuates and is a short range forecast that can be determined only up to around 30-90 minutes in advance with relative accuracy. Weather Forecast [North of Anchorage]: Rain showers likely before 7pm, then rain and snow showers likely between 7pm and 1am, then a slight chance of snow showers after 1am. Cloudy, with a low around 30. Calm wind. Chance of precipitation is 60%. Little or no snow accumulation expected. Additional Information: Cloudy skies with rain and snow, a bright moon and quiet aurora forecast will prevent aurora viewing. Weather Forecast [North of Anchorage]: Scattered rain showers before 10pm, then scattered rain and snow showers between 10pm and 1am, then snow likely after 1am. Cloudy, with a low around 31. West wind around 5 mph becoming calm after midnight. Chance of precipitation is 60%. Weather Forecast [North of Anchorage]: A chance of rain and snow showers before 7pm, then a chance of snow showers. Cloudy, with a low around 26. Southwest wind around 5 mph becoming calm. Chance of precipitation is 50%. 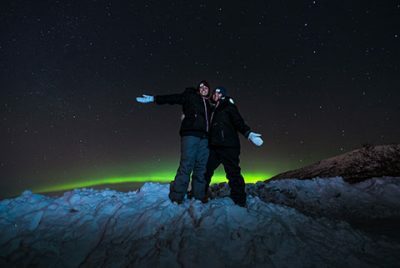 YES, YOU CAN SEE AURORAS FROM HERE! 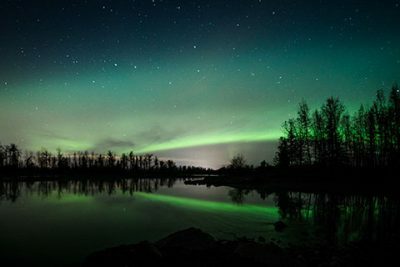 Though Fairbanks is often assumed to the the best aurora viewing location in Alaska, there are some distinct advantages to chasing the lights in and around Anchorage and Southcentral Alaska. 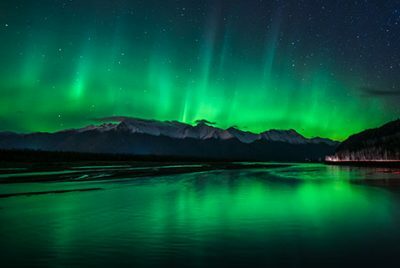 Both cities fall within the auroral zone, which in Alaska is around 60°- 70° N. At this latitude, communities positioned beneath the band will see northern lights almost every dark, clear night. That said, the following information may help you decide which location suits your aurora quest best. Anchorage: mountains, boreal and temperate rainforest, coastal areas, rivers and lakes with areas of open water for beautiful reflections throughout the season. Fairbanks: hills, boreal forest, [open lakes and rivers early and late in the season]. 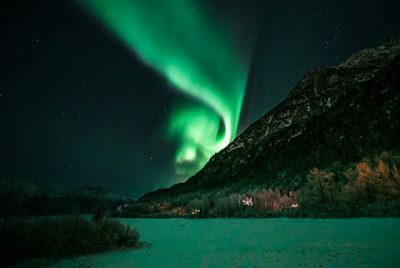 Anchorage: Auroras often tend to be brighter and more active farther equatorward, relatively warmer temperatures, a variety of landscape features to include in aurora photography, longer aurora viewing season. 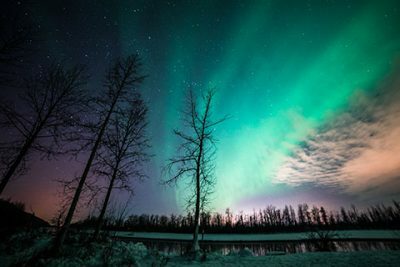 Fairbanks: More clear sky nights, more chance to see aurora during low activity periods. 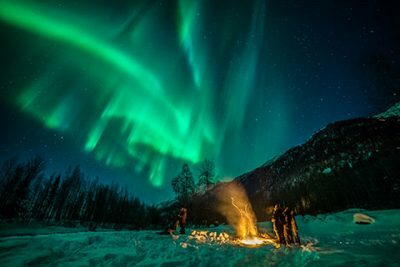 Aurora chasers with a night or more in the Anchorage area have little to lose and much to gain by reserving an aurora tour here. 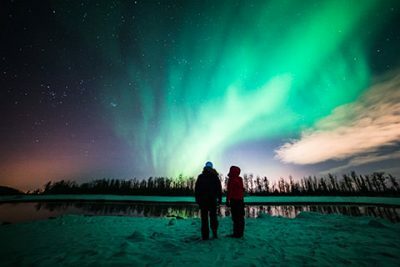 Even those heading to or returning from Fairbanks will increase chances of seeing the northern lights, and enjoy the differing experience of each location. So if time allows, include both cities in your winter travel plan!